Seriously, who has time to a sit down breakfast during the week? I’m up early and the first thing I want is my coffee……then breakfast. On weekends I have the luxury to enjoy a hot, homemade breakfast but weekdays I’m usually eating on the run so I need something quick and easy. I don’t think it can get any easier than a protein shake. I pour some almond milk in my blender, a scoop of protein powder, and a handful of frozen fruit – blend and voila, breakfast! I have been drinking protein shakes for years. I have tried the good, the bad, and the nasty. There are so many protein shakes out there so how do you decide which one to buy? First off, before you even decide on the flavour, you need to look at the company and the ingredients. Why? Well, so many protein shakes are full of fillers – fillers that are not needed and a complete waste of money. 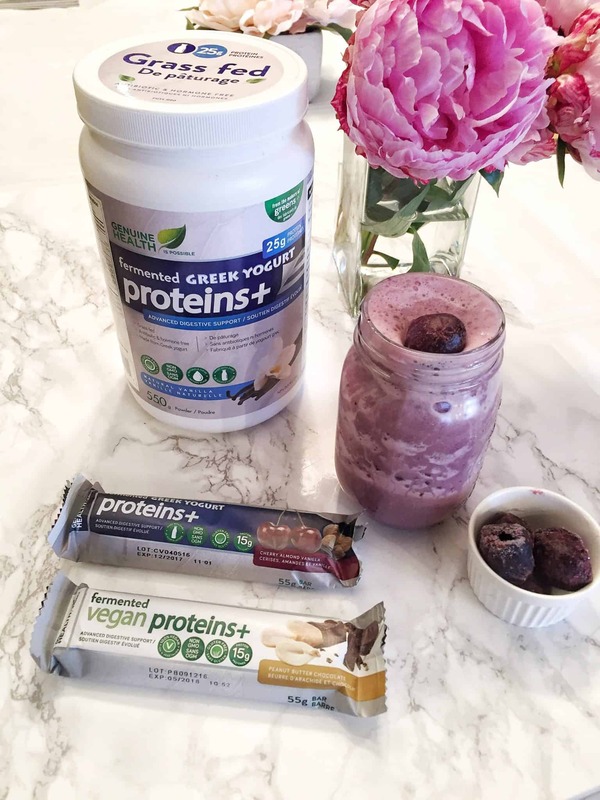 I have tried the Genuine Health Fermented Vegan proteins+ a few months back so I was excited to try the fermented Greek Yogurt proteins+. Stewart Brown, Genuine Health’s Founder and President. At the heart of what drives Stewart’s ongoing work is his commitment to original research, validation of formulas and credibility within the natural health industry. The most important thing is that the products he puts out make a difference in the lives of consumers, a value that extends back to his days at Supplements Plus where he witnessed first-hand the dichotomy of some people using natural products for curiosity, and others depending on them for survival. Products that genuinely help people is the cornerstone of what Stewart and Genuine Health stands for. Read more about Stewart on the website. Genuine Health uses only the purest, highest quality ingredients in all of their formulas, sourced from natural, sustainable sources. I have had many whey protein shakes in my day and many have left me bloated and gassy, not a good feeling. I love that this shake is fermented. What the heck is fermented you say?? Well, it means that the product will be easier on your gut and easier to absorb. The fermented Greek yogurt proteins+ is formulated to provide maximum absorption, strengthen gut health, and provide 25 grams of fully fermented protein from grass fed California dairy. Fermented Greek yogurt is high in protein and provides the amazing unique, nutritive benefits of dairy, without the digestive disturbances. Fermentation ensures optimum absorption from a superior protein source. Conscious sourcing matters! The cows that produce milk used for the fermented Greek yogurt proteins+ are raised, pastured and farmed in dairies committed to sustainable practices, producing milk that is free from hormones, antibiotics and GMO’s. 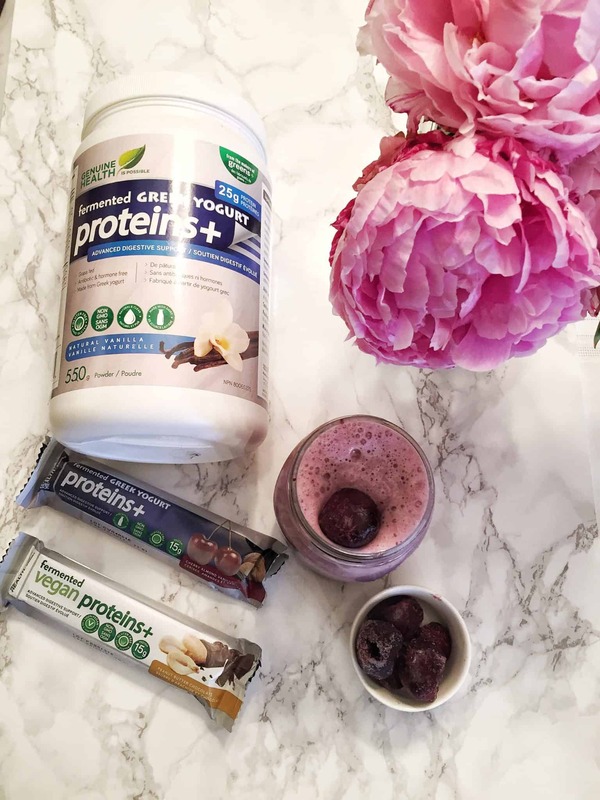 This protein powder has only 140 calories per serving and 25 grams of protein. You would have to eat approximately 4 eggs to get the same amount of protein. I got to taste the vanilla favour. I always buy the vanilla flavour in any protein powder as it is the most versatile. If I want to make it chocolate then I add a tablespoon of cocoa to it. This time I decided to add frozen cherries to my shake. I was craving some summer like fruit in December. I find that this vanilla shake has a caramel like taste to it. It isn’t overly sweet and does not taste like cardboard like many other brands. The greatest thing is that I didn’t feel bloated or gassy after drinking this shake. The only con of this protein shake……well, it’s not even a con. The protein scooper was in the middle of the canister. I had to laugh when I opened the canister as, of course, the scooper was nowhere in sight so I had to dig and feel my way through the canister looking for the scooper. This happens with every single protein I have ever bought and anyone who has bought a canister of protein powder knows what I’m talking about. Have you tried any Genuine Health products? What is your favourite shake brand and recipe?